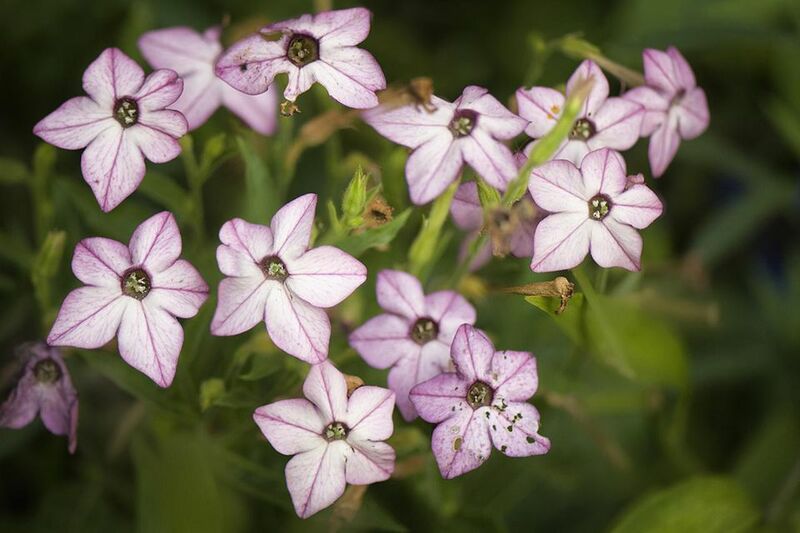 Flowering tobacco (Nicotiana alata) belongs to the notorious Solanaceae (nightshade) family of herbaceous perennials, which contains the poisonous belladonna and datura species, as well as vegetable garden favorites like potatoes and eggplant. Flowers of the genus Nicotiana bear some resemblance to petunias, another nightshade relative, in appearance and evening fragrance. Flowering tobacco plants produce fuzzy, sticky foliage and flower stalks with nodding trumpet-shaped flowers. Each flower has five petals that flare at the end. The flower colors complement one another so that you can plant a mix for an attractive large nicotiana bed. Most varieties are various shades of pink, white, red, and pale green. Nicotiana cultivars vary from 18 inches to 5 feet in height. Gardeners looking for tall flowering tobacco varieties should stick with heirloom types, as newer compact varieties are bred to flower while still growing in nursery six-packs. Nicotiana is named for the 16th-century French diplomat Jean Nicot and has been gracing gardens with its stature and fragrance for hundreds of years. Ironically, Nicot believed the unusual flowering tobacco plant was a cure-all for everything from headaches to cancer. While the opposite is now known to be true as regards tobacco’s "medicinal" properties, the flowers do provide beneficial nectar for giant moths and hummingbirds. The light and airy habit of nicotiana are welcome in any sunny spot in the flower garden. Flowering tobacco is a natural choice for a cottage garden. Grow it alongside other heirloom annual flowers like balsam, love-in-a-mist, or spider flowers. You can plant red varieties of nicotiana in the hummingbird garden, but birds are attracted to all shades of flowering tobacco. White flowering tobacco is a must for the moon garden, as the fragrance intensifies at night, and hummingbird moths will seek out the tubular blossoms for their rich nectar content. You can find transplants of newer nicotiana varieties at the nursery, but most of the tall heirloom types must be started from seed. Nicotiana seeds germinate readily in warm soil, sometimes even within 48 hours of sowing. Light aids germination of these tiny seeds, so press them lightly into the soil but don’t cover them up. You can also sow these directly in the garden, where Mother Nature will cue the germination of the seeds. Plants should be spaced about 12 inches apart. These plants demand warm weather and warm soil to thrive. Choose a site with full sun and rich, moist, humusy soil. In areas with hot summers, a few hours of afternoon shade will keep plants from developing sun scorch. Don’t set transplants outdoors until at least two weeks after your average last frost date, as flowering tobacco plants are warm-season annuals that appreciate the same balmy nights as tomatoes. Cold, wet spring soil encourages root rot and damping-off disease. Keep nicotiana plants moist, and fertilize them monthly throughout the growing season, which lasts from early summer until the first frost. Stop deadheading the plants at the end of summer if you’d like a few volunteers to self-seed for the following season. Flowering tobacco thrives in full sun to part shade. This plant prefers well-drained soils that are moist and high in organic material. Nicotiana likes to be kept consistently moist. Provide it with 1 inch of water per week, either through irrigation or rainfall. It will, however, tolerate drought conditions for short periods. Nicotiana likes moderate temperatures. It will struggle in extreme heat and succumbs to cold temperatures quite easily. If you are trying to grow it as perennial in marginal climates, make sure to cover them with mulch before weather grows cold. In very hot climates, it may do best if it receives some shade in the heat of the day. Feed these plants immediately after planting potted specimens, then monthly through the growing season. Like all types of tobacco, Nicotiana alba includes toxins, including nicotine, anabasine, and many other alkaloids. It is listed as a class one toxic plant (major toxicity) by various databases of dangerous plants. This plant is poisonous to all animals, including humans, and its toxins are easily absorbed through the stomach and lungs. In sufficient amounts, it can cause agitation, elevated heart rates, and even coma. Although this is not a plant that is often ingested accidentally, except by grazing animals, you should keep pets and children away from it. Nicotiana is propagated from seeds, and it can be allowed to simply self-seed in the garden. If you choose to save seeds, start them in late winter or early spring in small pots filled with seed-starter mix. Cover with 1/8 inch of soil, and keep warm until they sprout, which usually takes 2 to 3 weeks. Make sure all danger of frost is past before you plant the seedlings outdoors. On seed trading forums, look for nicotiana seeds listed under flowering tobacco, woodland tobacco, and jasmine tobacco. Nicotiana alba 'Baby Bella Antique Red' has larger-than-usual, deep-red flowers on two-foot plants. N. alba 'Lime Green' has greenish flowers; it makes a fun bouquet filler or good partner to plants with purple flowers. N. alba 'Nikki Red' is an All-America Selections award winner. Perfume series are 20-inch tall plants that are extra fragrant. Saratoga series offers the shortest plants, ideal for the front of the border. Flowers are shades of red, pink, and white. N. alba 'Sylvestris' has huge leaves and five-foot flower stalks of white blooms. The only pruning necessary with flowering tobacco is deadheading the spent flowers, which will stimulate additional flowering. Hold back deadheading near the end of the season if you want the plant to self-seed for the following year. Flea beetles and the tobacco hornworm are the most serious pests of flowering tobacco plants. You can recognize flea beetle damage by the presence of myriad tiny holes in the foliage. Floating row covers can protect young plants; larger healthy plants are seldom damaged to the point of death. Diatomaceous earth is a very effective deterrent to flea beetles, and it’s organic. If your flowering tobacco plant seems to have lost half its foliage overnight, look closely for the tobacco hornworm. The thumb-sized green caterpillars sport a nasty looking barb on their tails. This pest presents a paradox for the gardener: The caterpillars mature into the very hummingbird moths you may wish to attract to your flowers. If the caterpillar damage is bothersome, you can handpick the pests (with gloves) or apply Bacillus thuringiensis. One spot in the garden that isn't so suitable for flowering tobacco plants is the vegetable garden. Because some very popular vegetables, like tomatoes and peppers, are members of the nightshade family, they carry the same diseases. Mosaic virus and wilts can travel between nightshade members via pests like leafhoppers and may persist in the soil for years.